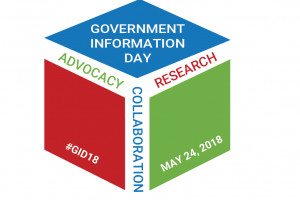 Registration is now open for Government Information Day 2018: Advocacy, Research, and Collaboration (GID18). This one-day conference will be held Thursday May 24th, from 9 am to 4:30 pm. The event is free to attend, and is a great learning opportunity for librarians, library staff, information professionals, and members of the public. GID18 will feature presentations on topics relating to local, state, and federal information, including the upcoming 2020 census. The keynote speaker will be Laurie Beyer Hall, Superintendent of Documents, from the U.S. Government Publishing Office (GPO). In addition to the presentations, attendees will be able to interact with various vendors and colleagues on topics relating to government information.